November 17, 6pm, Board Meeting – Meetings are open to the public. November 27, All day, Library Closed – Happy Thanksgiving! Holiday Adopt a Books are coming. Looking for a unique present for that someone special? Adopt a book at the library? Here’s how it works: Select a book from those available or suggest a book to the librarian. 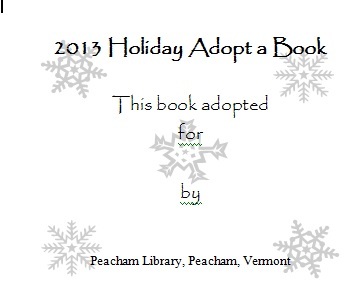 After you pay the library for the book we’ll put a special adoption label in and check the book out to your special someone. When the person has read the book, return it for others to enjoy – both the book and your generosity. Books may be adopted for people, pets, entities, the library, almost anyone. You can, if you desire, remain anonymous. The list will be available soon; the books will be on display in early December. Have a specific book you’d like to adopt — contact the librarian with the title, we’ll see what we can do! 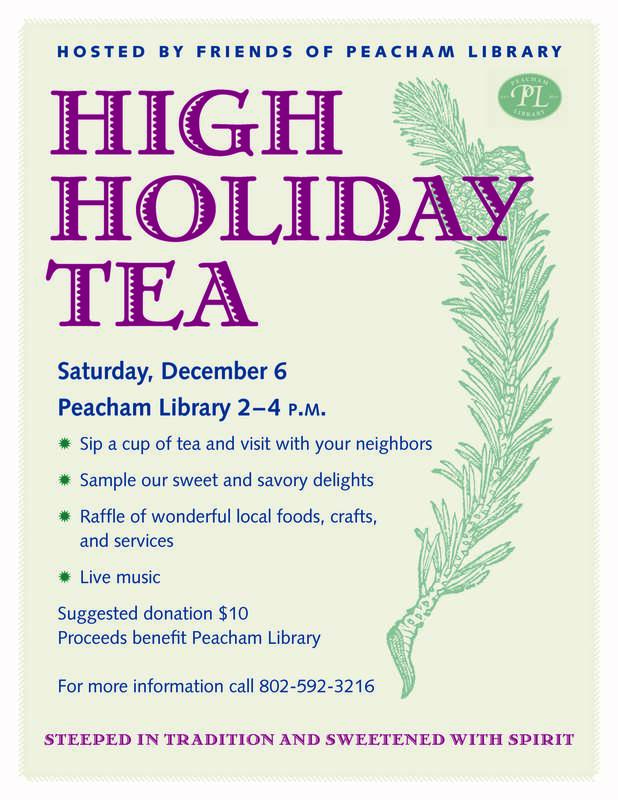 December 6, 2 – 4pm, High Holiday Tea — Sip a cup of tea and visit with your neighbors. Sample our sweet and savory delights. Take a chance with the raffle. All to support Friends of Peacham Library. December 13, 10am – noon, Santa, Crafts and Latkes — a party for the whole family. Start the morning with crafts, followed by a visit from the man in red, and end with a feast of latkes and applesauce.